I wanted to think of a novel vegetarian and gluten free seasonal side dish that’s easy to make ahead, serve warm or at room temp, and yummy as leftovers, that complements a traditional turkey Thanksgiving dinner… This is my take for this year’s sharing. I made extra quinoa as it’s great with a little left over turkey to turn a simple green salad into a delicious dinner salad. Or the basis for a yummy breakfast with fresh cranberries, pomegranate seeds, walnuts, and ground flax seed. My thoughts turn to my childhood Thanksgiving dinners– my favorite dishes were my great grandmother’s fresh cranberry sauce simmered on the stovetop, my grandmother’s mashed sweet potatoes topped with oven browned marshmallows, my Aunt’s perfectly browned scalloped potatoes with lots of onions and cheese, my uncle’s fresh pressed apple cider, then his apple sauce made from apple trees he planted on his farm. Oh my, goodness! although now of course I know marshmallows are not truly food. My original family has died or scattered far apart, both figuratively and literally. I especially miss my daughter this year in a different time zone, both prepping in the kitchen with her and taking a long trail dog walk together as food cooks. Yet I’m happy to have a chosen family to join, my partner and his original and extended family. Several in my daughter’s generation of this tribe are now vegan and/or gluten free; the majority of this gathering are not. Traditions run strong here too– one daughter insists to another only her dad knows the proper amount of milk and butter to use to turn the hand mashed potatoes into their favorite dish, and a grandmother’s dark cherry jello with pear, apple, and pineapple chunks hidden inside the wiggly mass elicits a huge smile from a happy college athlete granddaughter. Of course jello is not real food either, but that is not relevant to these two this night. Bon appetite! I use two pots to cook the quinoa separately as the red quinoa likes to simmer for several minutes longer than the white quinoa. Rinse each of the quinoas very well, then cover each in 2 cups fresh water. Add a dash of salt to each pot, bring just to boil, then reduce heat and simmer covered until water is just absorbed and quinoa is fluffy, about 18-20 minutes for the white and 22-25 minutes for the red. Remove from heat, fluff with fork and allow to rest uncovered as you chop veggies. Then using a large bowl, stir together your desired mix of white and red quinoa. Saute diced shallots in 2 T olive oil in a large frying pan until lightly browned and just starting to caramelize, then add to mixing bowl. Using same frying pan and a pat of organic butter if you dont have vegans joining in the meal, add caraway seed and stir for a minute, then add garlic to saute briefly, then chopped cauliflower. Stir for 2 minutes or so to lightly brown the cauliflower and coat in the spices, then add a couple T fresh water, salt and black pepper; reduce heat and cover to simmer for 2 minutes. Lastly add fresh cranberries to steam too for about 2 minutes until cauliflower and cranberries are just softening. Add to mixing bowl together with pomegranate seeds, and dress with a couple T of fresh lemon juice. Cover with foil when warming in oven. Stores well for two days refrigerated in an airtight Tupperware container. An extended heat wave wears away my energy in so many ways, including my desire to cook other than minimalist stovetop prep early in the morning. I find I have less appetite beyond munching on veggies and cool berries, yet know I still need to get good protein. I’ve been enjoying wonderful nectarines recently for breakfast with plain yogurt, a handful of fresh blueberries and chopped walnuts. Seeing beautiful plums at the market made me think it was time for this quinoa salad with plums, cooling mint and fresh lime, and quinoa, tempeh and pistachios that make it a protein powerhouse while still being light. Served over a bed of fresh lettuce from the garden, it’s a full nutrient, light yet satisfying meal. This salad will be best when made with a variety of plum that is firm and tart to sweet-tart, rather than super sweet and juicy. 1/2 cup pistachio nuts, as garnish immediately before serving. Rinse quinoa very well. Bring 2 cups of fresh water with a pinch of salt and quinoa just to a boil, then simmer on low heat for about 18 minutes until all fluid absorbed. Remove from heat, fluff with fork, allow to cool uncovered. Saute chopped tempeh in 2T olive oil, then transfer to casserole dish with airtight lid. Chop all remaining ingredients, then stir all together with cooked and cooled quinoa. Dress with juice and pulp of lime. If desired, press or finely mince 2-3 slices of fresh ginger root, add to scant 1/8 cup olive oil with a bit of fresh ground pepper for dressing. Refrigerate in air tight container. Serve garnished with pistachios, or another good alternative for garnish would be crumbled feta or roquefort cheese. Revisited this January– wanting a simple vegan meal with protein but no nuts, legumes, or gluten, I sauteed 8oz of tempeh and turned this salad into a delicious “one pot” meal. Perfect for when the season is changing and you’ve had too many holiday sweets. This salad is light yet quinoa is high in protein. 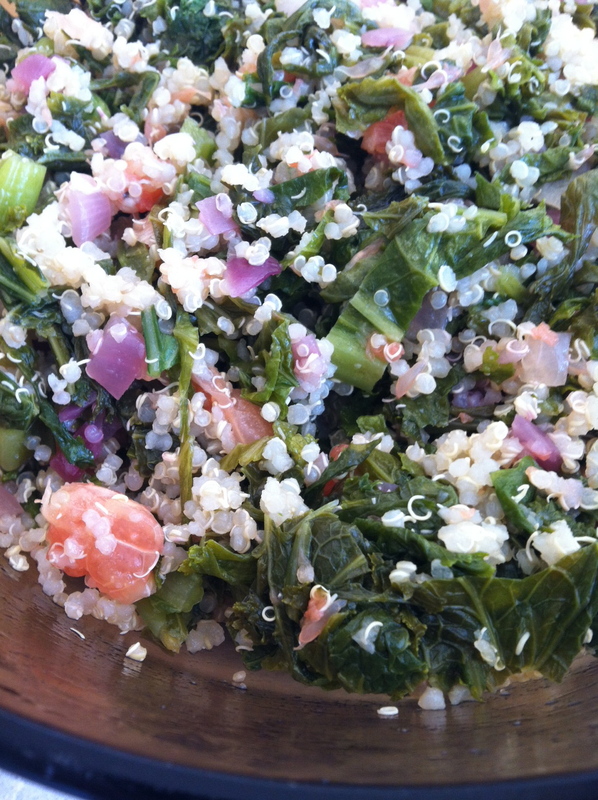 The red onion and mustard greens pack a punch, and the grapefruit serves as a perfect dressing. High in sulfur and vitamin C, this salad will help push aside both sweet tooth cravings and a stuffy nose. Rinse quinoa very well, then bring 1 1/2 cups fresh water, pinch salt, and well rinsed quinoa to a boil. Reduce heat to low and simmer covered for 20 minutes. Cook until water is absorbed. Remove from heat, stir with fork to fluff, and allow to rest/cool 5 minutes. First cut any tough center stems away to compost, then roll mustard greens and chop lengthwise into slim 1/4 inch strips. Using a cutting board that will allow you to preserve the juice, peel then cut grapefruit into bite sized pieces. Using large soup pot (to accommodate bulk of uncooked greens), saute onion in 2-3 T olive oil for 3-4 minutes. Add minced garlic, stir for 1-2 minutes. Add chopped mustard greens, stir well over medium heat for 2-4 minutes. Add about 2 T water, cover and steam for 2 minutes, until wilted and bright green, but not mushy. Remove from heat and cool. After greens have cooled, mix all ingredients together including the grapefruit’s juice. Serves 5-6, makes good leftovers 1-2 days, served warm or at room temp. Rinse quinoa well, then place in 1 1/2 c fresh water with a dash of salt, bring to boil then turn heat down to simmer covered for 18-20 minutes. Remove from heat and fluff with fork. Rinse beans well, chop and dice all vegetables and combine all. Dress with squeezed lime, and store in airtight container in refrigerator until ready to serve. Garnish with organic nonfat yogurt or feta cheese for additional protein.